Arsenal Discs was founded with a dream of revolutionizing a growing sport. We have been playing this amazing game for nearly 15 years and we saw an opportunity to differentiate ourselves and to promote the sport we love to play. We are here to meet your needs and to provide the most appealing and high-performing discs on the market. At Arsenal Discs, we utilize computer software and engineering equipment to create the best discs on the market! When designing our discs, we consider physics, aerodynamics, player comfort and more to ensure optimal performance. When designing our discs, we use a repetitive but effective process of testing and redesigning. We have spent months creating CAD drawings, using the drawings to machine prototypes, doing field tests, and using field test results to improve CAD designs. This process was very expensive and time consuming, but vital in ensuring that our customers are satisfied with our product. Engineering at Arsenal Discs was done very carefully and with extensive amounts of consideration. To create the best discs on the market, many material properties were tested and considered. Durometer, Elastic Modulus, Tensile Strength, Fracture Toughness, Yield Strength, Coefficient of Friction, and Specific Gravity were all analyzed and tested. Geometry also played a big role in affecting flight patterns. When designing particular flight patterns for our discs, many physical principles went into our calculations. Moment of Inertia, aerodynamics, center of mass, air flow circulation, drag forces, gyroscopic tendency, and circular motion were all crucial to outstanding flight characteristics. Extensive testing and prototyping was done to gain an adequate understanding of what effects influence the disc’s flight pattern. Once this understanding was established, it was used to create geometries corresponding to desired flight patterns. 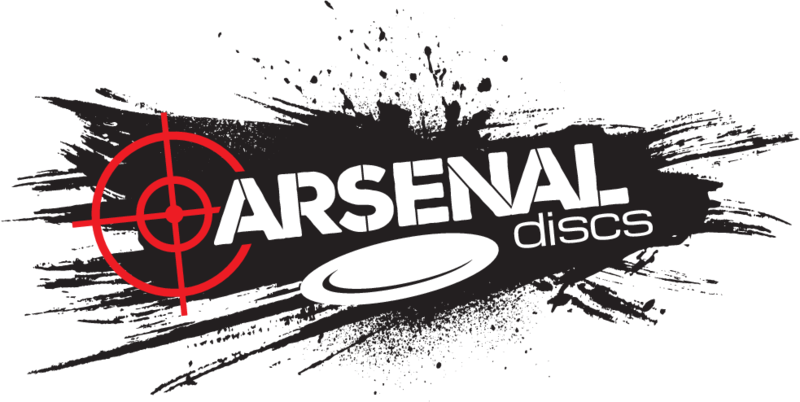 At Arsenal Discs, we have one goal: Grow the Sport. We have been fortunate enough to receive fantastic support and feedback about our first-run discs and we have reinvested those profits to grow bigger and better. Our long-term goals include opening sports camps, sponsoring tournaments, and hosting school-related events to increase appreciation for the sport. We will use our appeal to reach new populations that have not yet been exposed to the great game of Disc Golf. All profits will be recycled until Arsenal Discs has made a considerable impact on the sport of Disc Golf. Throw Arsenal and follow us along on this journey!